Forever steeped in Spanish history and culture, Santa Fe has been celebrating downtown together every autumn for over 300 years. In what is the country’s oldest civic celebration, our annual Fiestas de Santa Fe is truly a unique spectacle for any visitor to The City Different! This week-long festival marks the celebration of the reconquest of Santa Fe by the Spanish in 1692 from the Pueblo Indians. Led by Don Diego de Vargas, the Governor of New Mexico at the time, the Spanish “peacefully” took back the city after 12 years of exile that started with the Pueblo Revolt. Every September, cries of “Viva la Fiesta!” and “Que Viva!” ring throughout the streets as we pay homage to our heritage, our history and our coming together as a community. The start of Fiestas begins with the Novena Masses of thanksgiving, in which the newly elected Don Diego de Vargas and La Reina de Santa Fe are knighted and coronated. There is a procession which takes La Conquistadora (a small wooden statue of The Virgin Mary and the first Madonna brought to what is now the US in 1626) from the Cathedral Basilica to the Rosario Chapel, at Rosario Cemetery in Santa Fe. There are 9 Masses throughout the week before La Conquistadora is taken back to the Cathedral to kick off the festivities. While traditionally we gather to celebrate the Spanish reconquest of the city from the Pueblo Indians, the festival has come to encompass a children’s pet parade, the Hysterical/Historical Parade, mariachi’s and music on the plaza, arts and crafts festivals, the Fiesta Ball and the burning of Zozobra. Having a bad year? 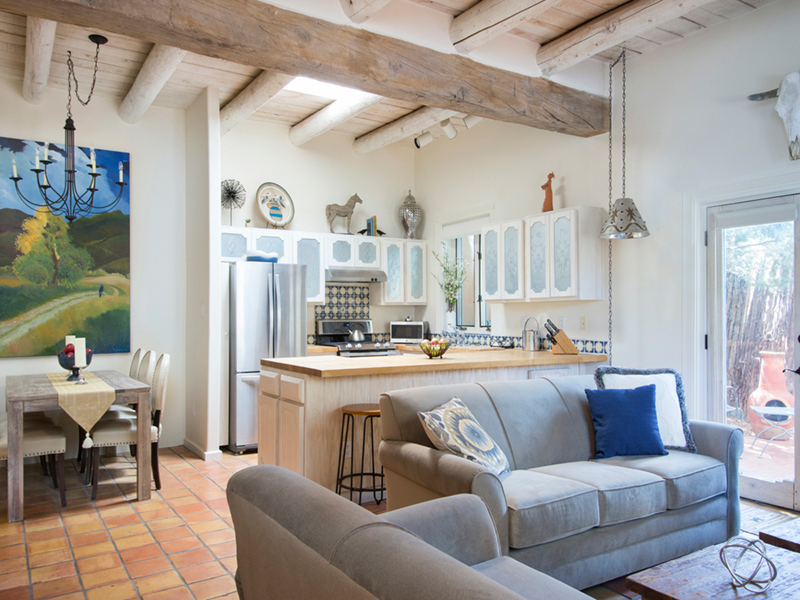 Then this may be the perfect time to join our Santa Fe festivities. On the Friday before Labor Day each September and to kick off 3 days of celebration, there is an incredible burning of a 50 foot marionette puppet named Zozobra at Fort Marcy Park. While Zozobra literally translates to “anxiety” in Spanish, it is his other name “Old Man Gloom” that describes him best. Stuffed with bushels of shredded paper, which traditionally included old police reports, paid-off mortgage papers, divorce papers, and slips of paper with tales of woe, this giant puppet literally embodies gloom. These days people are encouraged to write down exactly what is causing them gloom to leave in the “gloom box” in the weeks leading up to the burn. These worry-filled boxes are then left at the foot of Zozobra to burn alongside him. It is through this tradition that Santa Feans have been able to shed their worries and troubles of the year past in flames and celebration. When are Zozobra & the Fiestas de Santa Fe? Fiestas begin with the burning of Zozobra. The 94th Burning of Will Shuster's Zozobra takes place on the Friday before Labor Day, August 31, 2018. They conclude with the Fiesta Fine Arts and Crafts Market (Fiesta Weekend) on Labor Day Weekend September 1 @ 9:00 am to September 3 @ 5:00 pm at the Santa Fe Plaza. You can find more information at www.santafefiesta.org or for a list of all the events please see here. 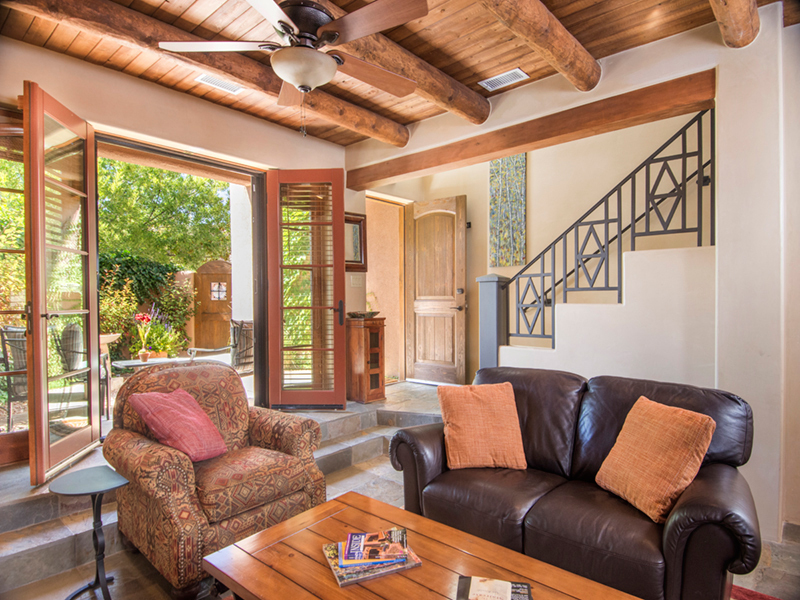 FEATURED PROPERTIES FOR LAS FIESTAS! 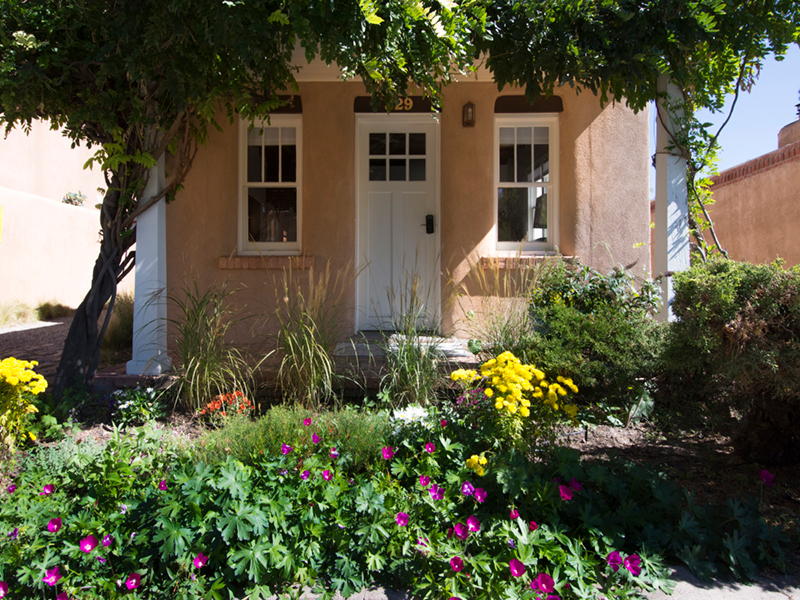 Be a part of the history, romance and intrigue that has made Santa Fe famous! Adobe Destinations encourages all our guests to come experience the charm, colors, traditions and culture that make Fiestas de Santa Fe! 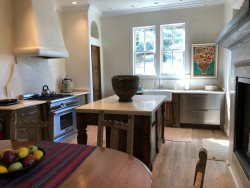 We offer beautiful homes downtown near the Santa Fe Plaza, Canyon Road, The Railyard District as well as within the foothills near Ft. Marcy where Zozobra is burned.